Of all the skis I tried at this year's SIA show, the Blizzard Cochise was easily the biggest surprise. The Cochise didn't just win best of show—it changed how I look at rocker. Let's call the Cochise a rocker evolution: the maturing and perhaps finally the true realization of rocker's full potential. To really understand what Blizzard has achieved with the Cochise, you've got to talk, oddly enough, about hard-snow carving performance, so let's begin there. We know rocker is good in powder. That's where it all started. 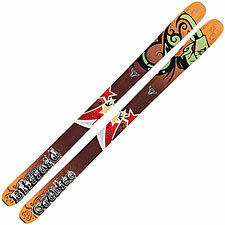 But since day one, rockered skis have floundered, to varying degrees, on hard snow. Rockered skis have generally proved so pitiful on hard snow that many of us have been reassembling ski quivers to cope with differing conditions. Prior to riding the Cochise I would have sworn the one-ski-quiver concept was dead. And then I found myself carving high-speed GS turns on rock-hard snow down the frontside of Winter Park Resort on the Cochise. What leaped out at me immediately was how natural the ski felt. The Cochise doesn't merely survive on hard snow; it thrives. The ski is both stable and lively, smooth and active. It rips. The Cochise's natural feel on solid ground is apparently due to its 'natural' rocker—a smooth curve from tip to tail, rather than the complex geometries of early-rise tips and tails. Simplicity in this case proves sublime. After only a few turns on the Cochise, you may find yourself wondering why anyone would ever build a ski any other way. Aha, you say—but what about powder performance? True, at Winter Park there was hard snow to sample and not much else. So I waited patiently, and found myself atop Chair 9 on a first-tracks steep-and-deep morning at Telluride, Colorado a few weeks later. My expectations of outstanding powder performance were not disappointed. The Cochise has a silky, supple feel in untracked snow. With this combination of area and shape, you expect good (but not excessive) flotation, and good resistance to chop. You get both. Just as on hard snow, the ski is balanced, fluid, and natural. Is the Cochise perfect? No. I'd say the new Mantra is quicker edge-to-edge on groomed snow. The Cochise, with a 28.5m radius (at 185cm), tilts toward medium-to-long radius turns. That did leave me ready to switch back to my Czars as the day worn on, and I found myself chasing my brother around tight powder bumps and trees through Gold Hill's cliff bands. The shortest size Cochise is 177cm, which is a little long for my body weight when things get tight. Still, I couldn't help smiling every time I got another opportunity to carve the Cochise's edges into the snow. It's easy to forget, even on a powder day, how much variation you'll encounter in snow type and quality. Through it all, the Cochise's ability to carve pure, smooth arcs is nothing less than groundbreaking. With the Cochise, Blizzard has fused the magical feel of a rockered powder ski with the uncompromising performance of a true carver. Absolutely one of the best skis of the year.